"Buy Bust" will be getting a global premiere as the closing film of the New York Asian Film Festival next month. Opens in Philippine cinemas on August 1, 2018. 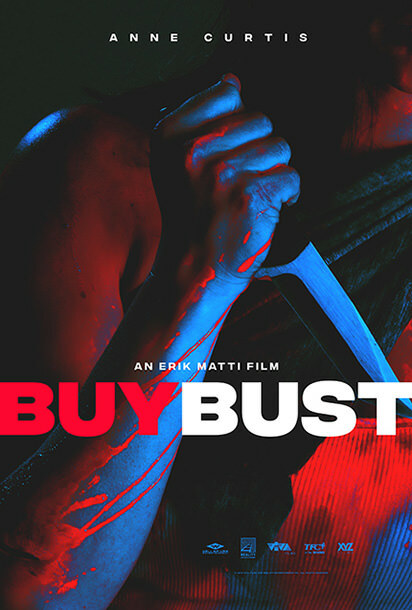 The highly-anticipated film “Buy Bust” by critically-acclaimed director Erik Matti has been acquired by Well Go USA for North American Cinema release. Well Go USA announced the acquisition of North American rights to BUYBUST, the latest from master Filipino filmmaker Erik Matti (On The Job, Honor Thy Father). Well Go USA will release the film to North American theaters later this year, followed by a digital and home video release. BuyBust will be at the New York Asian Film Festival on July 15th, have its Canadian Premiere in Montreal at Fantasia on July 18th then will be in Comicon as part of the 21st Annuel Superhero Kung Fu Extravaganza panel on Thursday, July 19th. 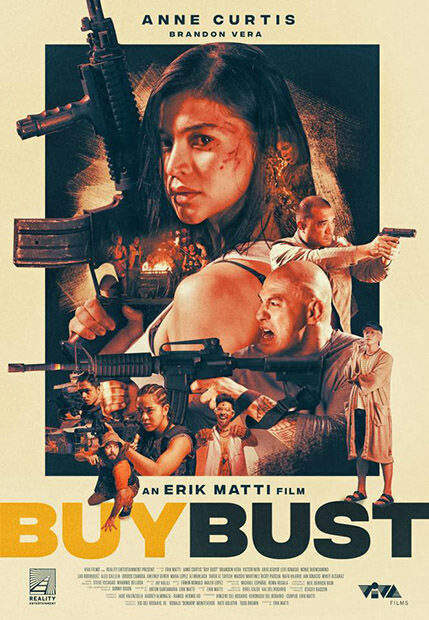 WellGOUsa presents Erik Matti's BuyBust, in US cinemas on August 10th. Pulsating action and lacerating social commentary are the ingredients of an outstanding genre outing by Filipino filmmaker Erik Matti. The New York Asian Film Festival’s closing film is both brazenly cynical and brilliantly executed. Filipino genre pioneer Erik Matti has delivered one of the most blistering action pictures since Mad Max: Fury Road (2015) on a fraction of George Miller’s blockbuster budget. BuyBust is a non-stop, adrenaline-soaked bloodbath that hits the ground running and doesn’t let up until the exhausting conclusion. Rivaling Gareth Evans’ brilliant film, The Raid, Matti delivers clever action set pieces with brutal fighting and top-notch camera work and choreography. The sheer scale of this film had me stunned early on, unable to pick my jaw up off the floor for the two-hour run time. Complex, brutal and always thrilling, BuyBust is a martial arts action marvel that pushes you into the deep end early on and doesn’t let you up for air until the credits roll. BuyBust will premiere in Philippine cinemas on August 1, and will be streamed on Netflix starting November 1. Just noticed that the local PH posters are banking on star power while the US poster has dialed down the crimson. It will be the opening film of Cinemalaya 2018. With regards to the poster designs, I think it's because Anne Curtis is a big star & top drawer in the Philippines, but not in the US. Standard marketing lang yan for major productions, whether locally or in the US. Even for major Hollywood films with famous actors. they usually ramp up the star power in their poster designs. This could be our "The Raid"
I've seen some clips on the workshop they did before filming the movie. Mukhang matindi ang immersion ni Matti sa mga characters to prepare them "in character" for their roles. ^^ At this time, parang hindi fair & accurate to compare Buy Bust to the other Hollywood action films on Rotten Tomatoes. 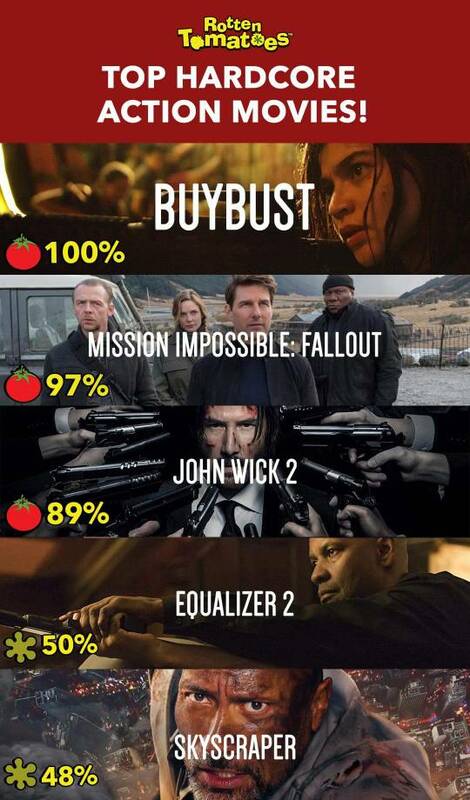 Buy Bust only has a total of 6 reviews counted so far (although all positive), while Mission: Impossible Fallout already has a total of 282 reviews counted. Hindi yata patas to just compare by the RT percentages, at least for now. Intense, gritty, violent & furiously action packed. However, I think the hand-held camera movements distracts during the hand-to-hand fight scenes, rendering some of the fight choreography into quick blurs. The set-up of the action does have similarities to Indonesia's The Raid, but I won't call this a complete knock-off. It does find it's own identity & the final third (up to the last perfect aerial shot of the Manila skyline) provides sharp social commentary on the Philippines' unending corruption & the current War on Drugs. Technical merits are all outstanding, with special notice to the excellent production design, sound & music. 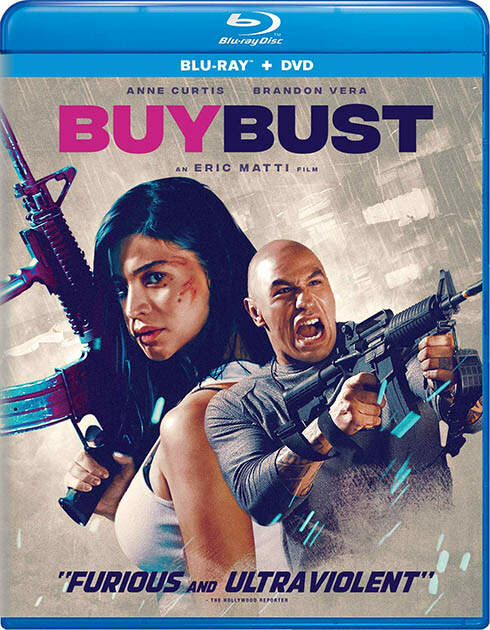 BuyBust (Erik Matti) ***1/2 - A rookie female police officer joins a drug buy-bust operation that goes horribly wrong and must shoot and fight her way out the byzantine maze-like slum areas to survive. This is my favorite Filipino film I've seen this year so far. Director Erik Matti proves once again he is the Philippines' most reliable genre filmmakers and he crafts a stunningly bone-crunching and intense action movie. It's quite similar to The Raid movies in its style but it does have some depth and social commentary to go along with the insane action sequences. If you're in any way familiar with what's happening in the Philippines today, you'll know what I'm talking about. It's a must-see. Yes it was like watching The Raid only in this hindi nakakapagod panuorin un fight scenes. The fight scenes in The Raid was a tad too long in some parts na nakakasawa na unlike this one which isn't..
Amazon lists the US Blu-ray release date as October 16, 2018. Hopefully this is just a placeholder cover. Mixed feelings for me, to be honest. I wouldn't rate this as high as many on this thread. It's just too far out for me to suspend disbelief. It certainly felt overboard. The premise was good but everything else: the bodycount, how the slums were presented, how the screenplay played out, the characters, it all felt too much. I thought the screenplay, in particular, could have been better. The acting was pretty good but Anne Curtis as a swashbuckling PDEA agent with the moves to kapow slumdog goons was a bit of a stretch for me. kung napanood nyo na ang raid redemption ma cocornyhan talaga kayo dito. pilit na pilit i gaya ang tense ng movie ng raid redemption. thumbs up lang ako sa cinematography. kakanood ko lang din nito. di ko magets bakit 7 ang ratings. should have been 5 at the highest. It was technically brilliant! At least for a Filipino film. The sound design was good, although I didn't fully buy the production design as there were plenty of times when I was aware that most of the "slum area" was a set. So the look was more polished than gritty. It was well cast, although the story was bare minimum so there was no emotional hook. So even though there was a lot of body count, the deaths didn't really have an impact on me. Also, the movie had a comic book feel to it so when it went to its serious political commentaries, they felt forced and awkward. But my major problem with this movie being an action movie was that I found the fight sequences to be repetitive, to a point of exhausting. Also, the fight choreography was sloppy in places. And was it just me, but how come ordinary slum dwellers knew martial arts?